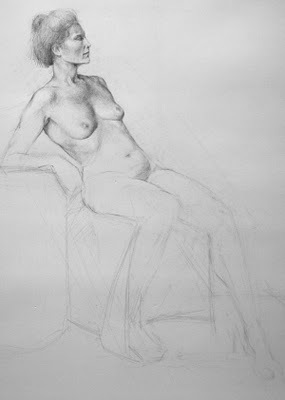 Ted lectures in the mornings, and in the afternoons we draw from the model. Contours, (the visible "lines"), are affected by the bulges and masses which make up the structure of the body. There are NO concave lines, because the human body is full and has volume. Even very slender people have substantial mass and volume. A concave contour is actually made up of a series of small convex forms. I've traced the contour lines I drew as they enter the body and correspond to interior structural masses. These contour lines are arranged, visibly or invisibly, along the body. The structural masses are arranged along these pathways, making a basketweave pattern throughout the form (under and over, in a network). Structures of the body are arranged in "families" of forms. Each structure has a rounded shape, growing darker as it turns away from the light. The darkest edge of a form usually ends just before the lightest edge of the next structure, creating a layering of forms and sub-forms. The hallmark of the classical approach to drawing is that nature is organized. Everything is designed with an economy of space, form, and function. Features of the body are never like snowballs thrown on randomly. See every point in relationship to the whole; nothing is in the right place until everything is. All the forms of the body are arranged on curving pathways, never straight or angular. These pathways create a network, like a hairnet. Pathways exist in 3 dimensions like a basketweave - sometimes on the surface, sometimes burrowing underneath. Pathways exist in two sets of arches, some arching up and some arching down. Structure is a vocabulary of forms. 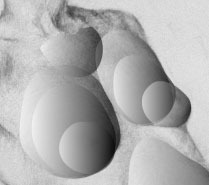 Shapes grow on the body outwards: ample, convex, superimposed, smaller in top of each other. Universal structural shapes are modified by gesture: squashed, stretched, twisted. Sometimes forms are so modified they are unrecognizable. See how these structures are perceived through the actions of light. Forms are layered - every form can be reduced to its underlying mass. The body is not a smooth surface, it is made up of specific shapes, it is "particulate". Train your eye to see the "specialness" of each individual shape. Continuity - everything in the body connects in a fluid, continuous manner. Contour reflects the 3-dimensional structure of the form. Monocular vision (like a camera, or closing one eye) has less perception of form - two eyes "wrap" around the form. Don't use tools like plumb lines and measuring rods - make yourself the measuring instrument. 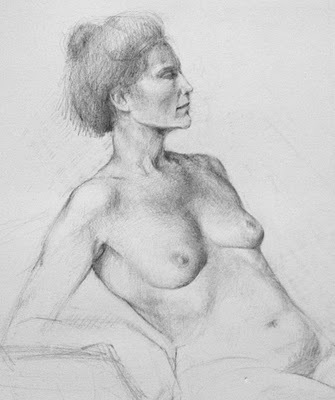 Only one point of your subject is NOT foreshortened, the point directly in line from your eye. All other points on the subject are forshortened to a greater or lesser degree. Drawing is all about recording what you see without being distracted by the symbolic, verbal, abstract symbols of what you are seeing (like the almond/dot egyptian symbol for "eye", which has nothing to do with what a real eye looks like). "Drawing is an exercise in human fallibility - it shows how wrong we can be."